and social media contacts for the author. 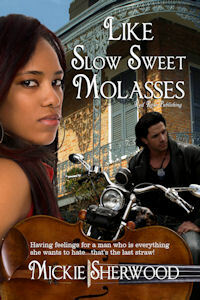 Today’s featured book is Like Slow Sweet Molasses, by Mickie Sherwood. Tagline: Sweet, spicy romance–a heartbeat away! wants to hate? That’s the last straw! her to touch–the one that pushes him out of her life.